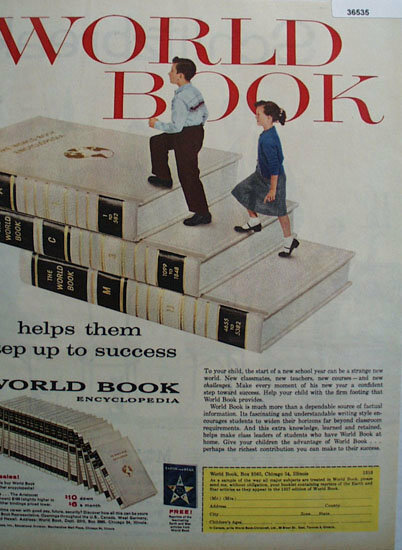 World Book Encyclopedia 1957 Ad. This color October 15, 1957 ad states World Book Helps them step up to success. To your child, the start of a new school year can be a strange new world. Help your child with the firm footing that world Book provides. Pictures shows boy and girl going up stairs made of World Book Encyclopedias. Magazine tear sheet picture is taken through plastic and may show wrinkles or crookedness that is not in the ad. This Original magazine tear sheet measures 10 inches wide by 13 inches tall. Items Similar To "World Book Encyclopedia 1957 Ad"
Smith-Corona worlds fastest portable Ad 1950.